Such a cute print! Soft and comfortable. Enhance and improve your bedroom decor with the Becky Cameron double-brushed 3-Piece duvet cover set. Tailored for a perfect fit and made with the finest imported microfiber yarns for ultimate comfort. This luxury duvet cover set is expertly stitched for durability to last a lifetime and raises the bar for coziness and elegance. Includes two matching pillow shams to bring elegance to any bedroom! • 1 Standard Sham: 20" x 30"
This is the cutest and softest duvet set I have ever gotten the color is perfect its so bright and cheery. It deserves 5 stars but the only reason I didn't give it 5 stars is that one of the pillow shams had orange writing on it and it wouldn't come out with washing. However, Overstock did take care of the situation at once, thank you. This is so worth the money. I got the King for a queen bed and it goes all the way to the floor on both sides of the bed and make it look even more inviting. 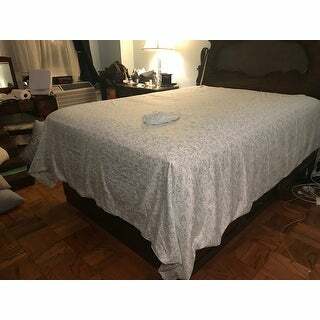 The Duvet set is very soft it washes well comes out of the dryer very smooth no wrinkles.The size is somewhat larger then my twin comforter I did not realize that this only comes as a king twin.The price was reasonable. This duvet cover went over an old flannel twin size red plaid comforter that is worn but still warm and has a lot of use left for use in our camper. This twin duvet cover is true to size and is so soft and cozy. The red flower print is very pretty and gives new life and warmth and softness to an old comforter that is filled with memories! Love this duvet cover! Perfect set and size for king bed. Love it. Second set purchased - too difficult to cram extra large queen duvet in washer - since used in guestroom, must be completely laundered in extra hot, sanitizing cycle - necessary for next guest! Having used the stated procedure for 4+ years has taken a toll on both the duvet and wash lady (yes, you guessed it - that is ME) - so decided to purchase cover which is easily laundered and replaced. This is just the perfect light grayish green color so that it will go with ANY color bedding - softer than imaginable, and not a wrinkle in sight when removed promptly from permanent press dryer cycle. My back is loving this item!! Same problem as Becky Cameron sheet set - this is made of incredibly thin fabric. King size duvet cover came in similar cloth bag that was smaller than 1/2 gallon milk jug. Also this is cut quite large. I have a good 6 inches of extra width and 6 inches of extra length when fitted on a king size down comforter. Nice color and feel, and the full-width zipper is more convenient than button closure. Again, not worth the effort to return a *** cover. Lovely duvet cover and shams. Reasonably priced. This is just OK! The fabric is soft but its way too long. 96x96 is way too long for a full/queen. This is on a queen size bed. Bought a king size duvet cover set . Love it.. very soft , size is perfect.. love the colors. Have washed few times.. it has retained the color , size and the softness. Will be buying few more for the kids who will be moving into University . SO SOFT! Yes all caps soft! The description and picture of the duvet cover set is right on the mark. They are mush softer than I had expected. The zipper is of good quality. I waxed it to be sure it would not snag. I am pleased with this set and do recommend them to anyone needing a duvet cover. This set did meet my expectations.I know it will exceed yours too. UPDATE: If I knew what a hassle the return process is, I would have never ordered from this site! I'm trying to speak with the THIRD customer service agent in over a week. I keep being told someone will reach out to me from the Overstock team and no one does. I've been waiting over a month to have this return processed. Do yourself a favor, and order from *, where at least if it doesn't fit, you can easily return it! This duvet is soft and beautiful in person but do not buy it if you have a standard kind duvet. The sizing is enormous and leaves several inches of fabric hanging off each side. It looks terrible. I will be returning! The ties inside make it easy to keep the duvet in place and I live that it has a zipper closure! Really love the pattern and softness of the fabric, but fabric is VERY thin and too big for the down comforter even though they are supposed to be the same size. Tried to shrink it but washing/drying but it didn’t work. 100% polyester. Don't like it. I received my new bed cover today. I love the print on it because it does represent springtime. When I opened the package I was expecting it to be a little thicker than it is. In the picture on the website it appears to be a bit thicker, but I'm certain it will be all the more comfortable when it comes to my night sweats. It shall be my reflections of spring and summer. Love this cover, it has a zipper rather then buttons which keeps the Duvet nice and snug, and the cover itself is so super soft, this is the second one I've gotten, and when I need a new one, I will for sure be getting it through this company. Very soft, as advertised and ample sized. Very soft and comfy,but are very thin. I purchased two of these in different patterns for my guest beds.would recommend. Love this Duvet. So soft and very pretty. Yes I would recommend. It's amazing! And being that it said king/cal king I thought it might be a little smaller on a cal king... But it wasn't! "Are there button or ties or something to keep the comforter in place inside?" Yes, there are ties on the inside of the duvet that keep the comforter in place. "How long are the ties inside the duvet?" "Are there inner ties to hold the duvet in place?" "Is this Duvet Set Slippery? Is this a slippery- material? The Becky Cameron Premium Ultra Soft Duvet Cover Set, should I expect the fabric being that its microfiber to be sliding right off the bed nightly." It is kind of slippery, my cat slides around on it.